These days the Mars Curiosity Rover is the one getting all of the attention and hype, glory hound that it is. However, its predecessor, NASA’s nine-year-old Opportunity Rover, just broke a distance record that is more than four decades old. On Wednesday, May 15, Opportunity took a quick jaunt, a little stroll of 263 feet, as part of its normal day-to-day routine exploring the Endeavor crater on Mars. Only this particular day, those few feet put the grand total the rover has traveled at 22.22 miles. This means that it has now driven farther on a non-terrestrial surface than any vehicle in NASA history. 22.22 is .01 more than the previous record holder, the Apollo 17 lunar rover, driven across the Moon by Gene Cernan and Harrison Schmitt in December of 1972. I can’t tell you how many things I’ve owned that didn’t last nine years without malfunctioning in at least one way. 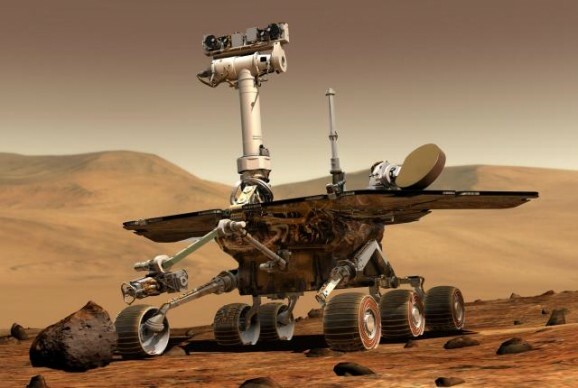 Yet the Opportunity rover is still going as strong as it ever was, proving to be one of the most cost-effective tools ever built, lasting 36 times longer than the original three-month mission. NASA reported Opportunity is finished with its latest duty, a complete circuit around the Matijevic Hill that sits on the Western rim of the spacious Endeavor crater, itself 14 miles in diameter. Opportunity took a counterclockwise route around Matijevic Hill, named for Jacob Matijevic, who for years was the engineering team leader behind the Spirit and Opportunity rovers. Opportunity drove about 1,169 feet around the hill, bringing its total amount of martian drive time a mere 22 miles. Sounds like daily traffic down I-10. 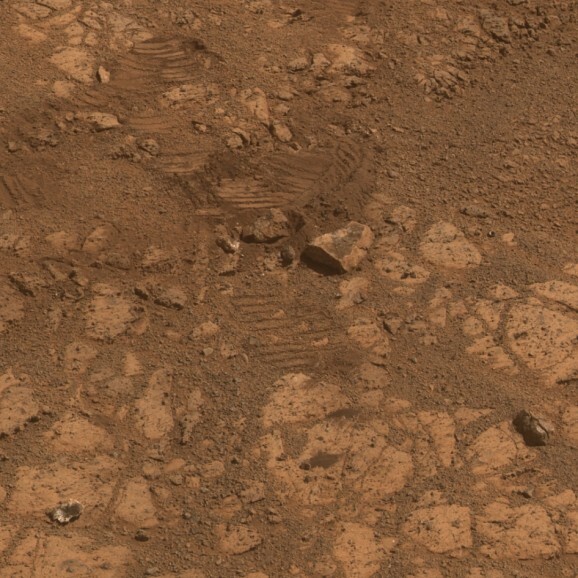 “If you are a geologist studying a site like this, one of the first things you do is walk the outcrop, and that’s what we’ve done with Opportunity,” explains Steve Squyres, the mission’s principal investigator out of Cornell University. This specific site was chosen years earlier due to orbiting spacecraft detecting traces of clay minerals nearby. Clay forms under the wet, non-acidic conditions that are favorable for producing life, though it will probably be a while before anything of that nature is determined. With all the press surrounding Curiosity, you may have forgotten that we already have a working rover on the surface of Mars. Even though its sister rover Spirit has long since been consigned to its Martian grave, Opportunity is still roving around the red planet and returning valuable science data. Apparently unphased by the new kid on the block, Opportunity has just sent back some headline grabbing data of its own with a picture of a never before seen formation on the surface of Mars. At first glance the new image looks like a variation on the Martian “blueberries” that Opportunity has seen lots of since it first landed in 2004. When they were first discovered, the spherical objects led to a lot of speculation about being a sign of life, but upon further inspection the “blueberries” proved to just be deposits that are formed by mineral rich water filtering through rocks and leaving behind the iron rich spherules. 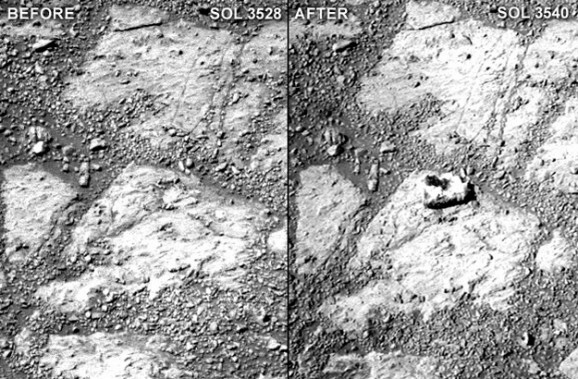 The new objects found by Opportunity are, however, not rich in iron and seem to be far softer than the previously seen “blueberries”. Opportunity’s principle investigator Steve Squyres of Cornell University is pretty excited by the rover’s find at the Kirkwood outcrop of Endeavor Crater. This is one of the most extraordinary pictures from the whole mission. Kirkwood is chock full of a dense accumulation of these small spherical objects. Of course, we immediately thought of the blueberries, but this is something different. We never have seen such a dense accumulation of spherules in a rock outcrop on Mars.